Engineering and construction group Amec has been given a facelift after recently merging with American counterpart Agra. The project is the latest of London design group Bamber Forsyth’s branding projects and launches this week. The centrepiece of the identity is a 3D touchstone, which the consultancy has used both as a line-drawn background image for printed literature, and as a coloured solid alongside the main logotype. The Amec name has been altered to a modern italicised sans serif, and appears in lower case, in contrast to the stern, black capitals of old. Developing the new brand and visual language was the responsibility of Bamber Forsyth design director Matthew Tolliss. He explains the thinking behind the new motif. 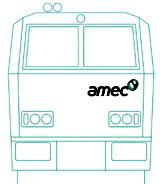 ‘Amec’s functional and process strengths are clearly visible in its old logo. We needed to show that, in addition to these abilities, Amec is a thinking organisation with a clarity of purpose, and its openness, agility and innovative nature are unified in one touchstone’. Amec group chief executive Peter Mason says: ‘After nearly 20 years of the old corporate identity, I believe it is time for a change, a fact underlined by the merger with Agra – the group’s largest ever transaction. ‘Our new identity is a confident statement of future intent. We now move forward as one company, one vision,’ he continues. Amec now combines what used to be Amec, Agra and Spie of France. It is a global player with 50 000 people in more than 40 countries. Following the group’s continued moves into Web technology the identity is adaptable to a broad range of visual media, both on- and off-screen.